Welcome to The Heartbeat of the Emerald Coast! Come shop with us on the beautiful Emerald Coast. We’ve got lots of terrific stores and even more dining options! Also, bring the kids out to the playground–they are sure to have a good time! Check out our Interactive Store Directory – just click the Store Directory tab at the top of the page. 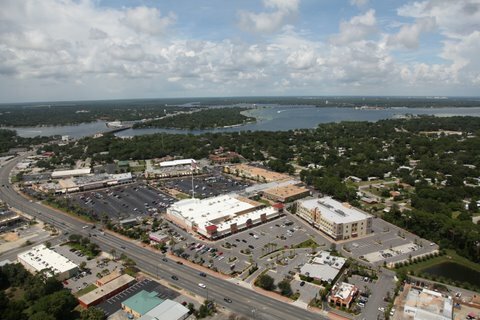 Uptown Station is the town center of Fort Walton Beach and is the heartbeat of the Emerald Coast. The area’s premier shopping center with over 60 national and specialty stores plus superb dining choices. Always worth its own visit to Uptown Station is Central Park, comprised of a village green, water features with dancing fountains for the kids, and an amazing children’s playground. Take the Express Train from Central Park Station and tour all of Uptown Station! We feature Family Movie Nights at Central Park. We show great family movies on our huge 30-foot screen. Come re-live the days of old time drive-in movies at our next Family Movie Night! Proudly flying the Stars and Stripes, Florida’s tallest flagpole, which watches over Uptown Station from 170 feet, is dedicated to all members of our Military, Law Enforcement and Fire Departments, and all first responders. On special days we fly a giant 50’ x 80’ American flag, as big as two tennis courts. Uptown Station has truly become one of the favorite destinations on the Emerald Coast. From shopping to dining, to special local events, and fun for the kids, we have it all. Come experience the entire Uptown District! We now have free wireless internet available at Uptown Station, centered on Central Park. Just open your laptop computer and log on! Uptown Station is now under new ownership! Now under new ownership, Uptown Station includes over 65 amazing stores including Dollar General, Ross Dress for Less, Chan’s Wine World, B.C. Pizza of Fort Walton Beach, Five Guys Burgers and Fries, Buffalo Wild Wings, Cox Communications, Beautiful Nails, Mary’s Kitchen, West Marine, Clarke’s Collectibles, The American Cancer Society, Bippy’s By the Beach Frozen Yogurt, Total Laundry Services, Daisy Day Brands, Shoreline Church, Clemenza’s at Uptown Italian Restaurant, Buddy’s Home Furnishings, Pet Supermarket, Renegade Barbershop, and much more! If you are interested in taking space in the office or retail buildings please click here. Read all about our incredible American Flag. We have a page set up with press releases, and video of the beautiful Dedication Ceremony. Go to the American Flag page. Stay Connected! Find Uptown Station, Fort Walton Beach on Facebook or Twitter!